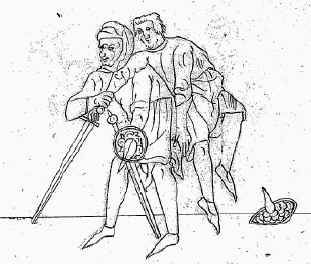 In the 1470’s Paris de Puteo had noted that in a formal duel if a sword was broken he might properly fighting by twisting his opponent’s arm, biting him, etc. But by 1553, Venetian, Antonio Possevino stated that to purposely discard a serviceable weapon in favor of fist fighting or to engage in wrestling, kicking, etc. was dishonorable because the contest should be a test of strength not of the body. Such actions were deemed appropriate for dueling gentry if conducted within the course of an armed struggle --that is, they were allowable while still armed. From the early 1500’s there is the account of a formal duel sanctioned by the Grand Duke Alphonso in Ferrara, Italy where the challenged party (in an obvious attempt to prevent such actions) attempted to wear armor with sharp projections at places where an adversary would typically try to take hold. Objecting, the Duke summoned forth a smith to file down the offending sharp points on grounds that such was not the proper manner of armor worn by knights in war. One late 1500s duel between a Signor Amadeo and one Crequi was fought on an island in the Rhone. Crequi brought Amadeo to the ground and without more ado killed him there (Amadeo’s relatives later complained of the undignified recumbent manner in which their fellow perished). Giraldi Cinzio describes a duel of c. 1564 in which an old fencing master named Pirro at Beneveto fought with Sergesto, a young former student. Pirro struck him on the back of the knee with the flat of his blade, pushed him to the ground, disarmed him and, seizing his throat, made him surrender. 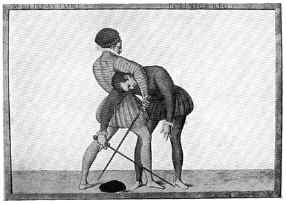 The master Salvatore Fabris in 1606 depicted a range of close-in and second-hand actions even showing a closing to take down the opponent by grabbing him around the waist. Yet Fabris only included material on grips and seizing reluctantly, because his text was focused on defense with the sword in a way so effective that gentlemen would "never need to come to grips on the seizing of swords". As with other masters, his method was essentially aimed at encounters of honor within the code duello. Apparently though, whatever his opinion of them as appropriate for his readers he did understand and teach these other skills in some way to prepare his students for them. Fabris’ close-in moves were influential enough for several later rapier masters, including Heussler in 1615, L’Lange in 1664, and Porath as late as 1693, to all copy them (Siegmund Weischner in his small-sword treatise, Die Ritterliche Geschicklichkeit im Fechten, of 1765 also shows a variety of closing actions and grapples similar to Fabris). Given the range of techniques and actions is in the historical accounts, a pattern is discernable. In a 1613 rapier duel between Sir John Heidon, the Earl of Dorset, and Lord Bruce, Heidon not only put his opponent on the ground, but jumped him afterward. Heidon wrote: "And there we wrestled for the two greatest and dearest prizes we could ever expect trial for –life and honor. Myself being wounded…I struck…passed through his body, and drawing back my sword, repassed through again…I easily became master of him, laying him on his back, when, being upon him …I could not find in my heart to offer him any more violence, only keeping him down". In a single combat during the English Civil Wars, Scotsman Sir Ewen Lochiel, chief of the clan Cameron fought a valiant English officer after several moments and exchange of blows, Lochiel finally disarmed his antagonist and they wrestled until they fell to the ground grappling. The Englishman gained the advantage but Lochiel managed to get his hands free, grabbed his foes collar and: "fastening his teeth upon his throat, brought away a mouthful of flesh, which, he said, was ‘the sweetest bit he ever had in his life.’"
Even into the 1700's there are notable accounts of grappling, wrestling and all-out fighting occuring during upper-class duels between skilled fencers. In a 1750 small-sword duel between two German noblemen, Swiegel and Freychappel, the combat lasted nearly an hour during which both were many times wounded. Eventually, Freychappel in trying to rush his opponent, tripped and fell and was instantly run through and killed by Swiegel. In his 1771 fencer’s guide for broadsword, A. Lonnergan at one point instructs, "When I begin to advance the left hand to disarm you, spring back, making a blow at it; or, if you think yourself as powerful as your adversary, oppose force to force, then the weaker must go to the ground, if some knowledge of wrestling does not prevent it." In 1772, a duel between Richard Sheridan and Captain Mathews, after missing with pistols, they closed with small-swords, which were each broken on the first lunge. "They then fought with the broken parts until each received many wounds, Sheridan some very dangerous ones. They at last fell to the ground and fought until separated by their seconds, Mr. Sheridan being borne from the field with a portion of his antagonist's weapon sticking through an ear, his breast-bone touched, his whole body covered with wounds and blood, and his face nearly beaten to a jelly with the hilt of Matthew's' sword." Yet, because a Renaissance master of arms produced one text on one aspect of fighting (i.e., rapier dueling) for one particular audience, does it necessarily mean that we can assume he was not at all adept at other styles of sword or rapier fighting? When reconstructing aspects of Renaissance fencing today, it is narrow and self-defeating to attempt to canonize the minority of masters who either disapproved of or failed to address close fighting from those who did. As Dr. Anglo has concluded, "Whatever the theoretical status of wrestling among the learned and knightly classes, it is obvious from surviving treatises that, up to the early seventeenth century and even beyond, many master of arms recognized the advantage bestowed upon their pupils by the physical exercise of wrestling – in order to develop agility, strength, and dexterity – and by practicing unarmed combat to use against the assaults of an armed assailant or in any other mortal affray". The abandonment by later generations (living under very different conditions) of techniques which were a long-established part of the repertoire of many masters does not negate either their significance or their martial effectiveness (all Hollywood musketeer slapstick aside). Just because later 18th and 19th century duelists decided certain moves were "dastardly" and "unsuited" to their notions (artificial or not) of "fair" gentlemanly contests, does not mean all men fighting for their very lives in the violent 1500s and 1600s felt the same. As Dr. Anglo has keenly summarized, "There were many different types of sword, and they were not all handled in the same way. There were many different masters, and – however much they traveled about to gain experience, copied each other, or developed similar solutions to similar questions – they each had their own ideas about how to do things…the history of fencing is a good deal less straightforward than was at one time supposed". There is little question that a swordsman in the 1500s & 1600s had to be fully skilled, not just for facing gentlemen il duello, but for a fight a’ la machia or duel a’ la mazza (essentially a private less formal quarrel out in the woods by either noble or commoner). He also had to be ready to defend himself against any unexpected onslaught, sudden ambush, or assault by strangers. He had to draw his weapon, size up the situation, face multiple attackers and survive or safely flee. In other words, he had to be able to fight those who weren’t "playing by the rules". There are numerous accounts of gentlemen in hot temper vengefully surprising their rivals. Affairs of honor wherein the adversary stood firm politely announcing, "On guard, sir!" was the exception not the rule. Seizures, disarms, close-in grabs, and left-hand parries have always been tricky, always been risky, and always required practice in all types of fencing. Perhaps there have always been fencers too conservative to approve of them or to risk coming corps-a-corps ("body to body") at all. But this doesn't mean that in the right circumstances they did not work and cannot work again. These were (and are) advanced techniques and even for advanced students may not always work perfectly (but then, what techniques does?). If the circumstances are correct, and they fail, it is the fighter not the technique which is at fault. Interestingly, some schools and masters were still teaching grips and seizures up to the 19th century. Against a lighter, shorter blade, these actions are indeed harder to effect, but that only meant a swordsman would have to be careful in the attempt -which was true with earlier weapons, as well. Referring to French military duels with "skewers" (epees) of the 1880’s, one author related "If it were not for the prospect of that pointed rapier before them these soldiers might sometimes kick and maul each other to death." For some sword enthusiasts today, historical fencing means martial arts, or techniques approached purely for self-defence, i.e., killing skills. For others, fencing itself seems to mean only the art of the single sword and only when conducted in a traditional pedagogy of mock dueling (a combat selon les règles or a combat "according to the rules"). Yet, historians of dueling have pointed out that in the 1500s and 1600s, little distinction was frequently made between brawls, sudden affrays, rencounters, private assaults, and "duels" (either formal or a' la mazza). This distinction even appears to have been the exception rather than the rule. Some more traditional fencers may see as "brutal" any earlier style that employs close-in actions, hand and foot blows, seizures, grappling, and take-downs. This is understandable, as these much ignored and long overlooked techniques are difficult to learn, dangerous to casually practice, and highly awkward to safely use in free-play or bouting. They may be considered "artless", "vulgar", or "base" to attempt to use them "in place of proper fence". This is a real shame. For these techniques have historical and martial validity and they can be as fluid and graceful as any weapon and should they serve to win a life-and death fight, to the winner they are neither improper nor crude. 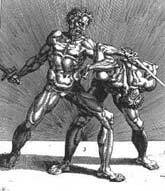 In Martial Arts of Renaissance Europe, Dr. Anglo, astutely comments on the styles of fighting in the Renaissance stating: "The techniques involved – dealing with unequal odds, left hand parrying, wrestling throws, ruthless battering about the head, stabbings, wards, and a total commitment to death and destruction – are all much the same as those described and illustrated by masters of arms from the late fourteenth century onwards. And, however much such behavior may later have been frowned upon by academic fencers, similar practices were still being taught long after they are conventionally supposed to have vanished from the sophisticated swordsman’s repertory. The view that rapiers were too quick to allow successful closing or grappling is simply untrue. But, it’s understandable that as these moves weren’t used, they weren’t taught any longer, and not being taught they fell out of use. One fights the way one trains after all. Wisely, one would not attempt these actions against an opponent unless one had practiced them considerably in the first place, otherwise they would certainly be foolish to attempt except in desperation (which did occur). Surely it is unreasonable to believe that these things could never have happened because an opponent would be hit before closing to range is not borne out by the available evidence? Nor is it supported by modern contests between "grappling" versus "non-grappling fencers". Given the variety and length of rapier blades and Renaissance swords that existed, and the greater and greater information now coming to light on the various methods for using them, it would indeed be a difficult proposition to justify. Thus, today’s historical fencing practitioners should endeavor to experience the opportunity to go up against someone skilled in them and use caution in declaring across the board they do not work or would not be effective. Were grappling and wrestling techniques always used in rapier fencing then? No, of course not. But has their historical and martial importance to rapier fencing been overlooked and under appreciated? Yes, from the evidence presented it obviously seems so. If a fighter could kill or defeat his adversary by skill with his blade alone, he surely would. That is what wielding the armament is all about after all. But, if opportunity presented itself and circumstances demanded it, he would utilize every action in his repertoire. Knowledge of grappling and wrestling would make it all the harder for such moves to be successfully used against him. We might ponder if there is a gap or hole in a student’s rapier skills if they are completely ignorant of these techniques, but who knows? All we can do today is examine the accounts of duels and compare them with the theoretical instructions in the manuals and our own limited modern experiments. It can be hard to judge the value these moves contain if modern rapier fencing enthusiasts today do not themselves regularly practice them, may not even be aware of them, and neither have used them successfully nor had them employed effectively against themselves. Perhaps then, when it comes to fighting with historical hand-weapons, the very view that there is such a thing as "close-quarter" combat is itself artificial? Since virtually all "all-out" Medieval and Renaissance combat involved, or at least anticipated and assumed, close-in techniques of grappling and wrestling, there was no real necessity to distinguish close-quarter from "non close-quarter". There was only the need to identify classes of techniques that worked at one range or another, and were employed either directly by weapon or by empty hand and body. It would seem it was not until close-in actions were later disavowed or discarded that a distinction apparently developed. 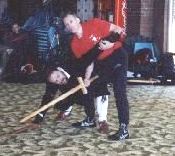 It may very well be that it was only the structured rules which limited the application of grappling and wrestling, first within certain tournaments and judicial duels and then the gentlemanly Code Duello, that armed combat (and fencing in general) came to be characterized as something "other" than close-combat (i.e., fighting at a range other than the weapon’s "reach"). ARMA’s perspective is that of training and instructing. Hence, our purpose is not academic theorizing but to interpret and practice this subject as a martial art and to train in these skills --as close as we can approximate to how they were historically intended to really be used (in a traditional approach). Since its beginnings ARMA has emphasized seizures, disarms, grappling, and close entering actions as crucial, vital, and integral elements in all historical armed combat, including rapier. These actions were real, they were historical, and they worked. They were used by all manners of fighters from all classes of society (indeed, they continued to later be described as highly useful by several by 18th century small-sword masters). In our modern study now we must not suppress them, ignore them, or make excuses for our ignorance of them because they do not somehow fit a preconceived notion of how "proper" fencing (whether Medieval or Renaissance) should have been conducted. Instead, we must expose them, explore them, and try to master them. There is certainly far, far more that can be said about this subject, and grappling and wrestling in Renaissance fencing alone could easily be separated into two or more distinct areas of research. The skills of entering in close to grab an opponent’s arm, hand or blade, disarm them or trap them were used and are something that today’s student of historical fencing should explore in detail. The techniques of closing to take down or trip up and opponent can make all the difference in a real sword fight and today are elements worthy of long-term investigation by Renaissance fencing students. It has often been said that we should not become prisoners to our style. Good ideas come from everywhere. There are brilliant ideas in fighting and there are foolish ones. The job of any earnest instructor is to honestly point them out. To quote the Master Vadi from c. 1480, "You can also use in this Art strokes and close techniques that you find simpler; leave the more complex, take those favoring your side and often you will have honour in the Art."